Here are 25 fitness tips for women to keep yourself in the right physical and mental conditioning it takes for you to reach your fitness goals. 1. What Are The Best Workouts? The best workouts are those that you are willing to do on a regular basis for life. If you hate the exercise bike, or Zumba you won’t stick with it, it’s human nature. Of course, everyone needs to realize that fitness is necessary and so there will be some level of sacrifice, but, there is such a wide variety of choices in ways to get exercise that anyone can find something they enjoy. Fitness is a mindset, so set your mind to it and just do it. Exercise is not enough when you are trying to lose weight, calorie control and eating a proper diet is just as important. In order to avoid fitness and weight loss plateaus, change your exercise routines regularly to keep the body guessing and shock it into action and avoid workout tolerance that stalls progress. Fitness comes in levels, donít over reach by starting in fitness with advanced level routines. Take the time to build up endurance and strength and reach those advanced levels in the proper manner. Soak in a cold tub for about 15 minutes after intense workouts. 55F degree water helps to soothe the aches and pains that can follow grueling workouts. Wear high quality well-fitting athletic shoes when you workout. The best athletic shoes provide the appropriate support and make sure your feet feel great during and after the exercise session. The best sneakers will feel good right from the start, and even better after some use. It’s best to step on the scale early in the morning before having anything to eat or drink. Your mental state is the hardest part of the fitness routine and establishing a set of goals that you want to achieve is one of the most effective ways for you to keep yourself on track and progressing. Whether it be to lose weight or put on muscle weight, set a goal that is achievable yet hard to reach and in no time youíll find yourself striving for more. As stated before, your biggest enemy is yourself. Motivation and concentration can weigh you down and sometimes, the beauty of the routine can turn into monotony. The only way to keep your fitness peaking, is to push yourself. Always strive for more and make yourself achieve results you could never have imagined. When following a diet and fitness plan for weight loss using a body fat caliper to measure fat loss is one of the best ways to see your success. Portion control is the name of the game in weight loss, so ditch the big dinner plate, and use a 7″ or less plate for all your meals, this ensures you eat less and it looks like a lot more food than it actually is. 13. Watch Empty Calorie Intake! Alcohol, for, example, has no nutritional value, it’s very high in calories, itís full of sugar and it’s very fattening. Make any weight loss plan easier, designate a bi-weekly cheat day where you will eat your faves guilt free. Pedometers are great little gadgets, keep one on you at all times to measure how many steps you have taken throughout the day. When working out outside, such as running or walking, wear sunglasses they will prevent you from squinting, which, relaxes the shoulders and leaves more energy for the workout. Whether or not it is the focus of your image, the core is integral to not only the show off but to help keep your whole body healthy. Each workout routine needs a good balance of core exercises in order to maximize its effectiveness. If you are able to keep your core healthy, you will be able to be that 60 year old you see in your neighborhood that amazes you with his ability to still go for a run at 6 am every day. Determination is the very reason you go to the gym. It’s comprised of your goals and ambitions, the reason why you go, who you go with and your future. If you can keep those things in mind, your determination will continue. Electrolyte drinks can be a great source of energy and vitality in gearing the body for working out, but, they have a lot of sugar and calories, so opt for the diet ones, Diet Gatorade, Diet PowerAde, and others provide all the benefits without the bad stuff. Prep for vacations and special occasions where you might eat more, or eat “badî foods by adding a little more time to your workouts before and/or after. An extra 10 or 15 minutes per workout can make a big difference to counter those times when you celebrate. Fresh herbs, spices, and fresh garlic go a long way to spice up and put some dazzle into vegetables that otherwise can become a bore to eat. If your workouts are feeling too easy, itís time to turn the routine up a notch! Okay, then opt for a healthier variety. Bryers 98% fat free ice cream has 10.1 grams less fat per 1/2 cup serving and about 30% less calories than regular ice cream. Bryers sugar free ice cream has about 25% less calories than regular ice cream. Besides all the other benefits of working out, there is the fact that when you do, it’s often a lot harder to eat unhealthy foods because you know you will undo all the exercise efforts you put in that day. The right fitness attire makes a difference. The reason that fitness clothing is made to fit snug to the body is because it moves with you and doesn’t cause distraction, such as, those that can occur when wearing lose sweats that flutter around or worse yet, fall off the waist. Put these 25 fitness tips for women to use and you’ll be on your way to reaching your fitness goals. Check back soon for our next fitness tips for women. 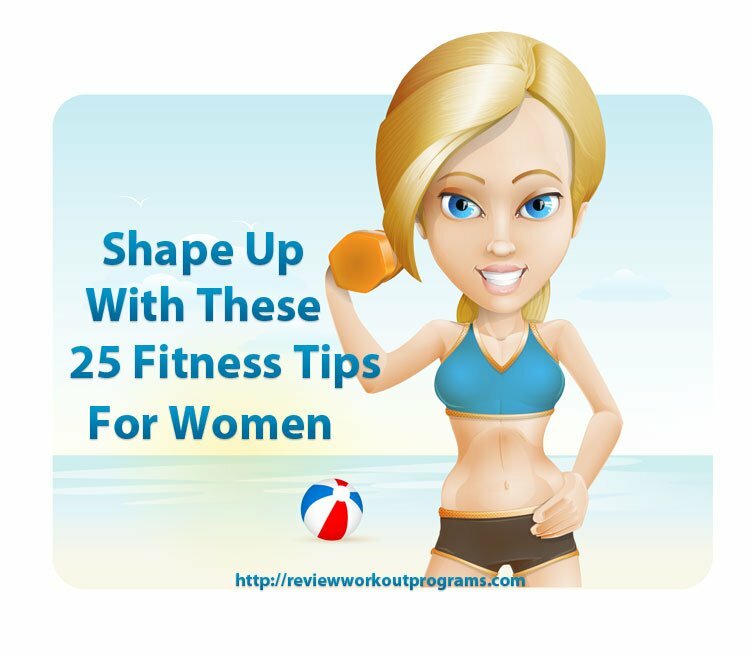 Review Workout Programs is a participant in the Amazon Services LLC Associates Program, an affiliate advertising program designed to provide a means for sites to earn advertising fees by advertising and linking to amazon.com. Copyright © Review Workout Programs 2014- All Rights Reserved.